A luxurious home designed for a photographer with a beautiful mix of furniture and decors. As always, the look of a house depends on who lives in it, what profession the family has and what kind of lifestyle they have. All of this affects the design of a home from its layout to the materials used. 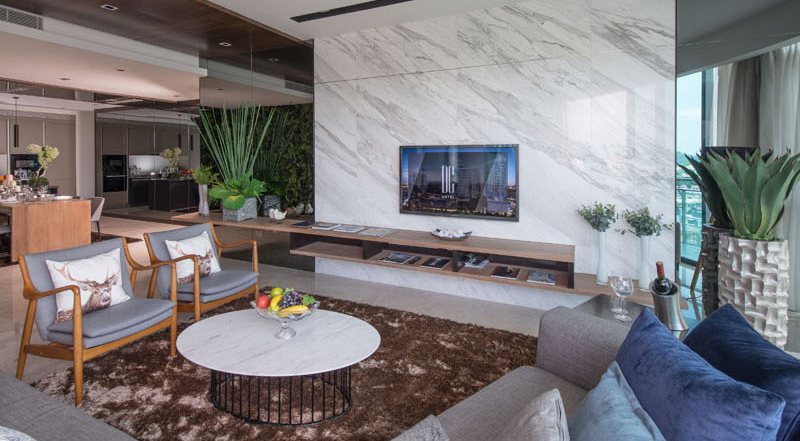 If you have seen the other home designs that we featured here on Home Design Lover, you will notice that there is indeed a difference of the design of the space depending on the owners. There are spaces for writers, painters, travelers and others. One look at their home will give you a hint about who lives in it. Today, we will feature an apartment where a photographer live. 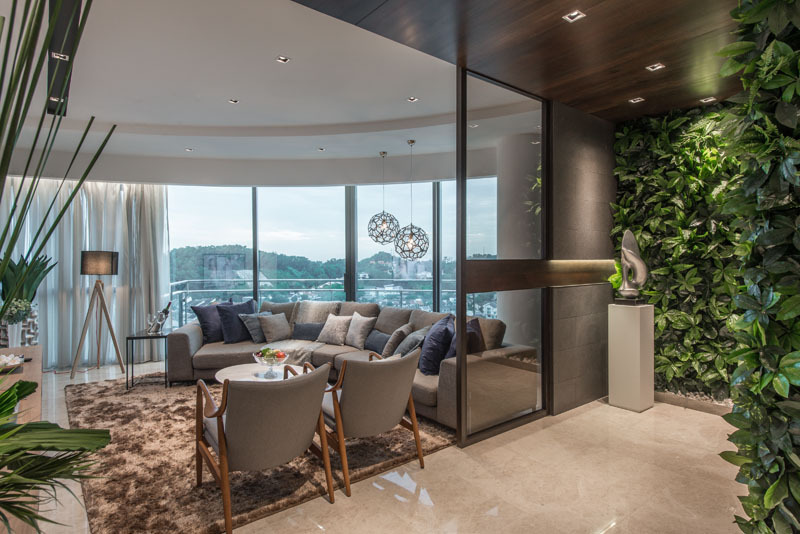 When interior designers Nu Infinity were asked to create a show unit in an apartment building in Kuala Lumpur, Malaysia, they thought about who the owner of this apartment might be before starting the design since it would have a great impact to the overall design of the space. 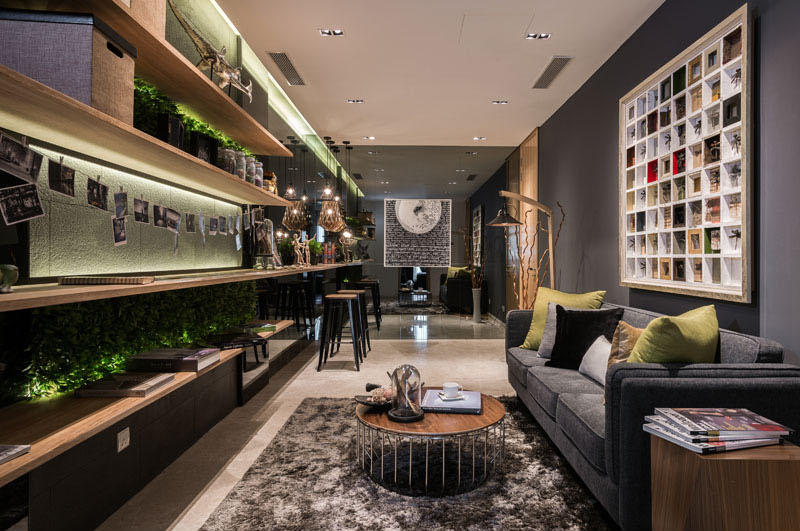 They decided that the owner would be an avid traveler and photographer, and that the apartment should be designed to incorporate natural materials into the interior to create a calm relaxing space, perfect for retreating to after a busy trip. 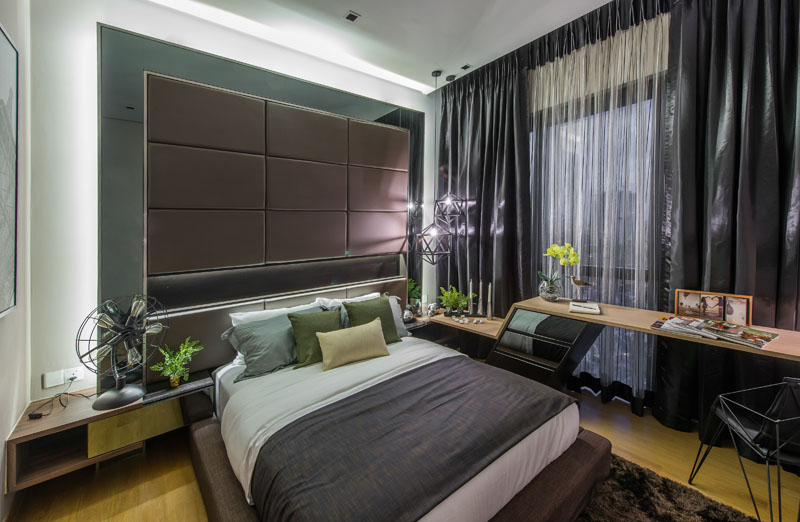 And that is exactly what they did resulting into a stunning sophisticated apartment. Take a look at the photos below. Unique feature: A beautiful modern apartment which is designed for a photographer. 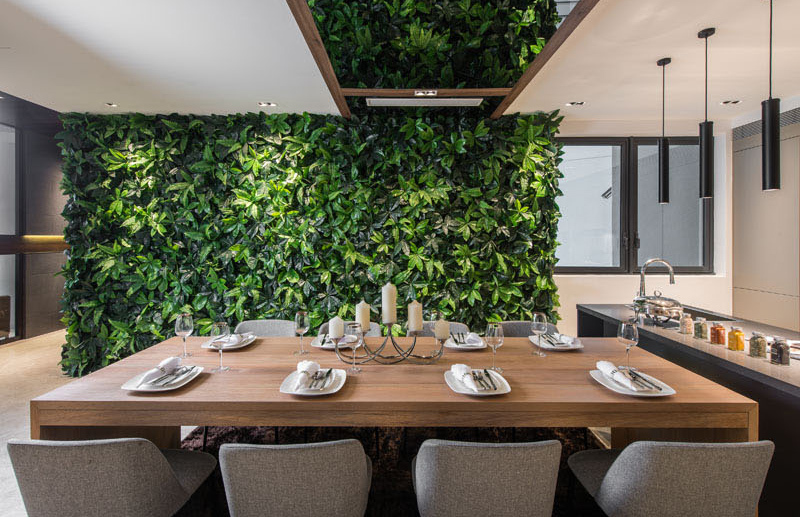 It has many impressive features in it that including a green wall in the dining area. Upon entering the home, there is greenery everywhere, like the green walls and this striking arrangement positioned in front of a mirror. The apartment also has a second lounge area, with plenty of shelving and room for a few stools. There’s also a wall of mirrors to help make the space appear larger. 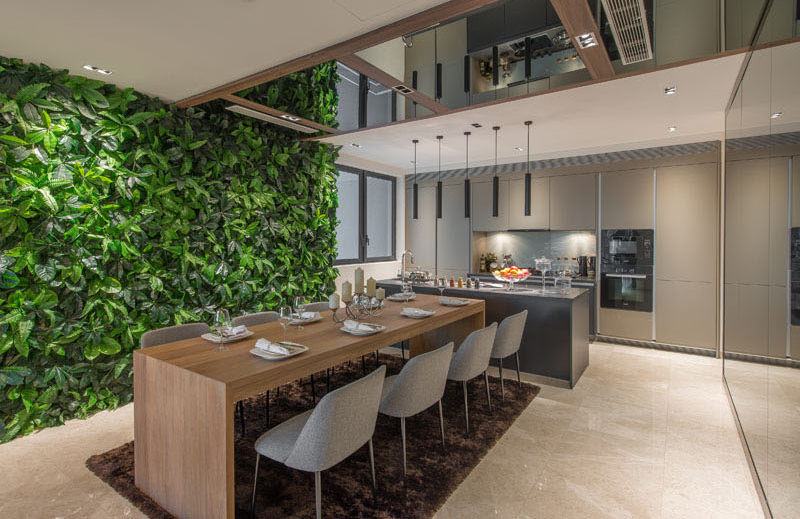 While heading out from the living room, one can see natural elements, like the wood feature ceiling and another green wall next to the dining area. A long wooden table with plenty of room for 8 people is perfect for entertaining. This living space has an eclectic mix of furniture in it and a television on the wall. Under it is a storage space for various items like magazines and others. From here, you can take a glimpse of the kitchen and dining area. 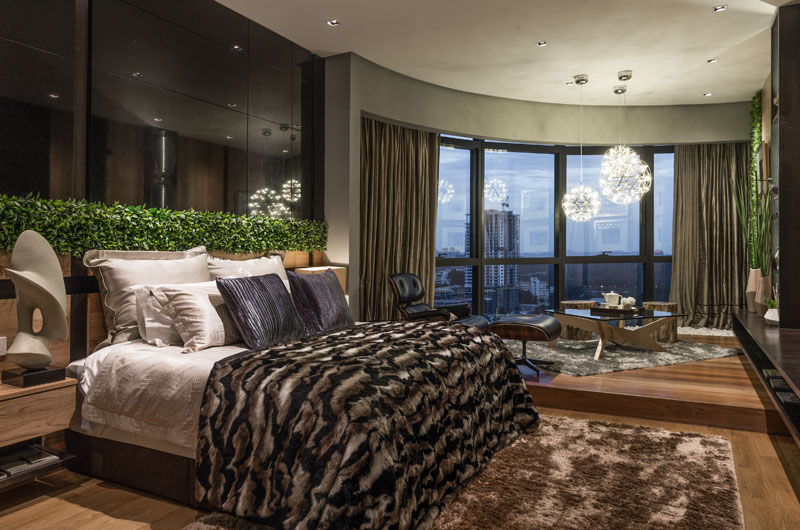 Next to the arrangement is the living room with curved floor-to-ceiling windows to enjoy the view. The living room is filled with soft colors and natural elements, as well as a curved sofa that matches the curve of the window. 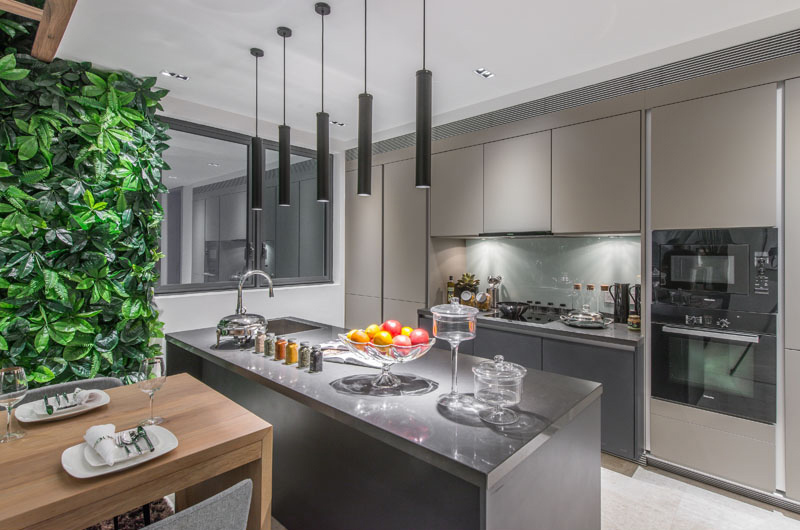 At the end of the dining table is the kitchen, full of grey cabinets with matching countertops, and 5 individual pendant lamps hang above the kitchen to light it up. The master bedroom is definitely a private retreat, with a dedicated space to relax and read a book. Notice how sophisticated this one looks like in terms of color, materials and texture. And it is nice to see the city while you are in here. 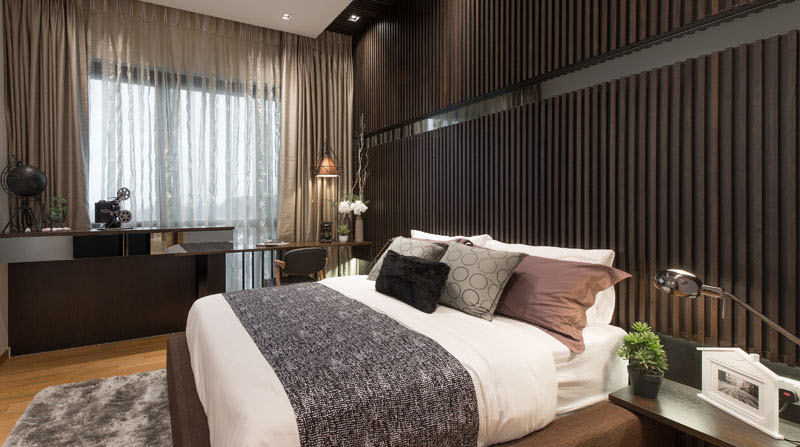 In the second bedroom, the natural touches continue, with a wooden feature wall and the addition of plants and flowers as decor. 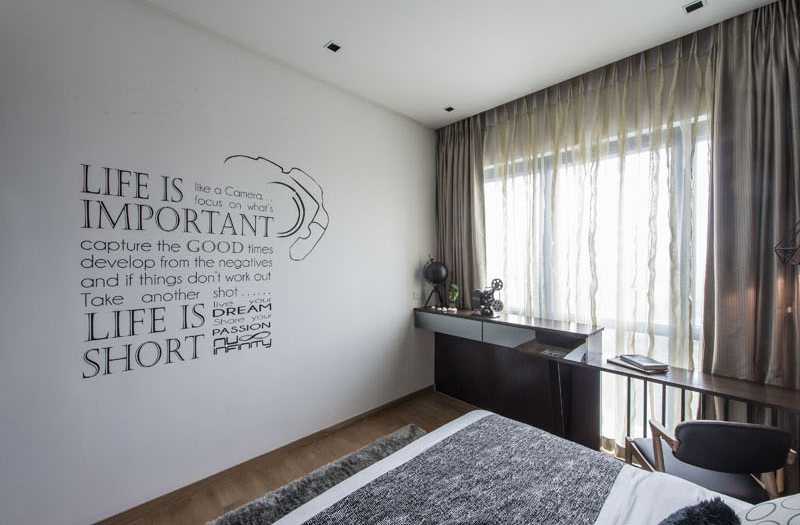 On the wall of this bedroom is a beautiful inspiring wall decal of a quote that the owner probably loves. 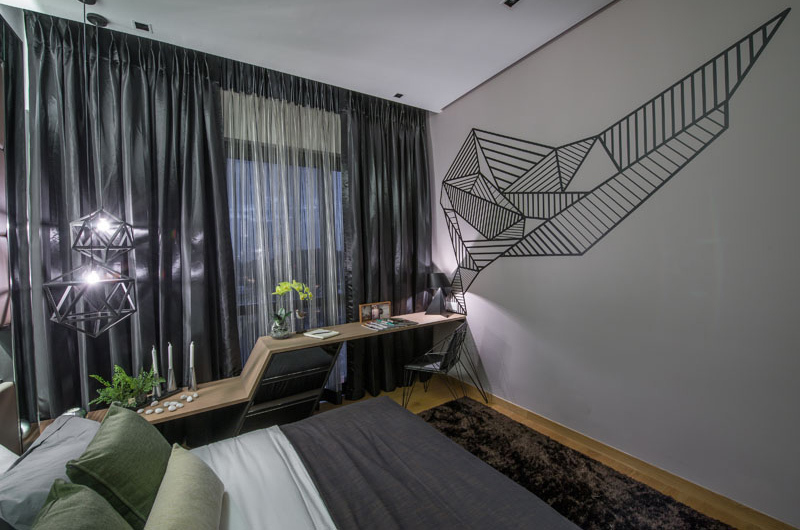 In the third bedroom, there’s a custom designed desk and graphic wall art. There’s a home office, with a built-in desk and a geometric wall decor on the wall. Notice that there are many geometry inspired items in the bedroom like the desk and the lights. 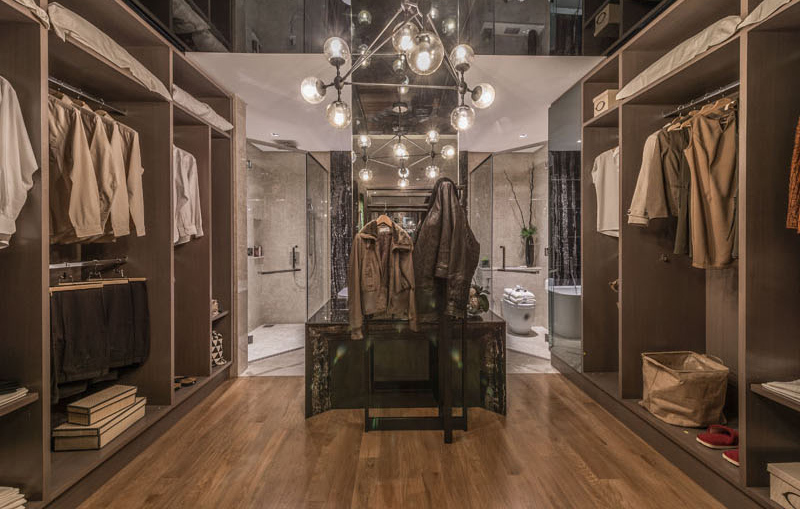 To reach the master bathroom, first you must go through the walk-in closet. Behind the walk-in closet is the bathroom, with a stone feature wall behind the bath, and the glass enclosed shower tucked into the corner. 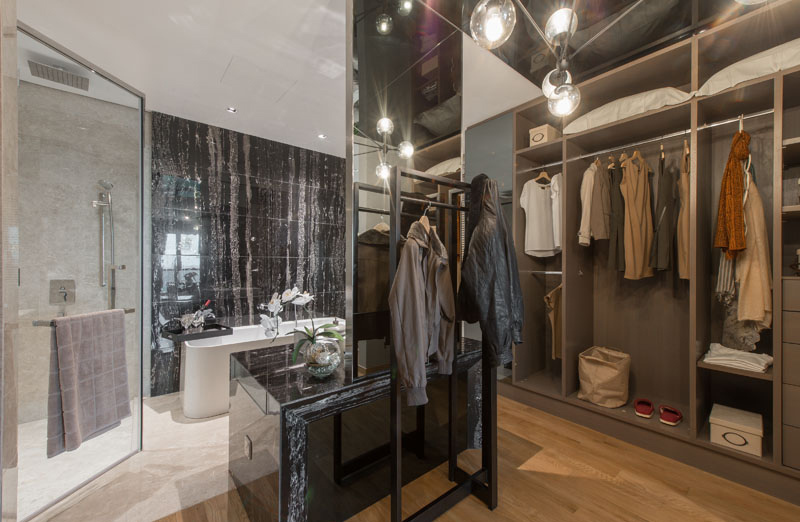 You can see here the wardrobe and the bathroom. It has wooden elements everywhere in it as well as a large chandelier that brings more sophistication to the space. 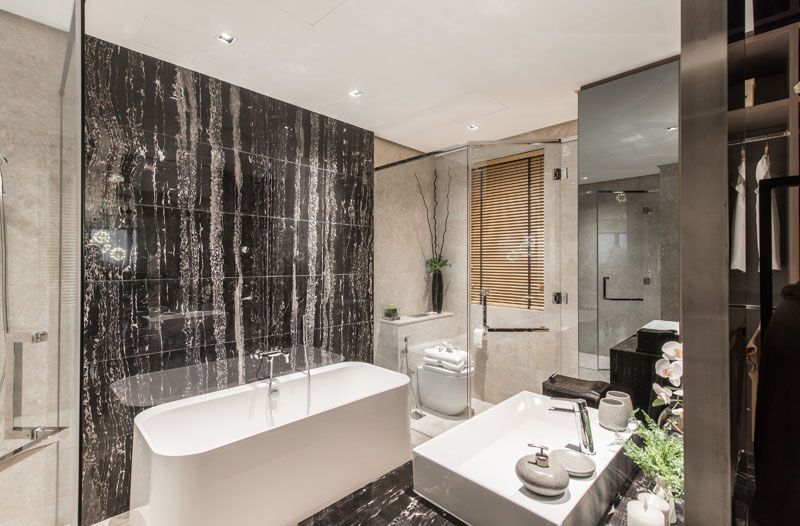 This is the bathroom with white fixtures and a marble textured wall behind the tub. There are also many glass elements in it as well. Beautiful, right? What I love in this space is its integration of plants in it. You can see that there are plants everywhere and it looks really beautiful and refreshing. Aside from that, the modern look of the house is just stunning including its layout. You can also notice that there are many elements in the interior that looks pretty nice in it like the wall decors and even its choice of furniture. I’d say that Nu Infinity did an amazing job for this home and it does look very creative which is just perfect for the owner of the space. How about you, what can you say about this apartment?